You could ask Kenneth Branagh where he found inspiration for the latest re-visioning of Jack Ryan, Tom Clancy's definitive character, but it would seem he looked to Martin Campbell's re-figuring of the Bond franchise in 2006 that led to a younger, more intense take on the Ian Fleming character. It would seem Branagh knew that Campbell did things right, that it was a more than flattering way to breathe new life into a franchise that had long since lost its luster yet Branagh also seems aware that simply going for dark and gritty has now become a cliche and doesn't immediately make your final product better off. It has to fit the tone of the character and Campbell along with Daniel Craig were able to create that correlation while Branagh has brought in Chris Pine (who has a knack for playing younger versions of iconic characters) and kept the timid, inexperienced attributes of our titular hero in mind while flattering his intelligence with modern technology and the issues and destruction that can be done in the wake of these advancements. While four films have come before this that center around the Ryan character the most successful of them were all released between twenty and twenty-four years ago. A reboot similar to this was attempted twelve years ago in the form of The Sum of All Fears with Ben Affleck in the lead role, but it never took off. While this attempt may indeed share the same fate as that one it doesn't mean this is a dull experience, but in fact it's pretty damn entertaining before devolving into standard action movie climaxes that are in line with the previous films yet insult the deliberate pacing and character development of the first hour of the film. In saying that, the good outweighs the bad for me here as Branagh has competently followed up his big budget/action debut with both an expertly acted film and a strong craft only lacking when it has to go for the bigger scope the genre this film falls into requires. Branagh has brought the character into the present world, easily introducing him to audiences who may not have seen or even heard of the Harrison Ford films and making his skills more than relevant while maintaining the core values and personality of our main character; something many were weary of when the marketing made this out to look more Bourne than Ryan. 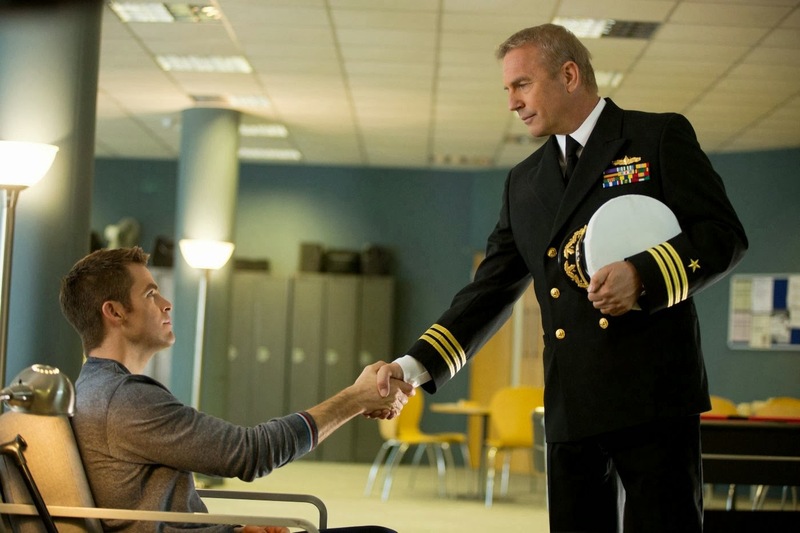 Thomas Harper (Kevin Costner) thanks Jack Ryan (Chris Pine) for his service. Immediately letting us know this is a new Ryan that holds no ties to the previous installments, we open with Ryan at college in London as he experiences the terror of 9/11 from afar. This act of terrorism strikes an immediate chord with Jack who would seemingly immediately enlist in the military as a Marine as we jump forward eighteen months as Ryan leads a group of soldiers over Afghan air space before his helicopter is shot down and Ryan finds himself in critical condition having barely survived the attack. His heroism in this moment along with his high intellect as displayed through not only his education, but his research and willingness to want to help his country is recognized by those at the higher levels of American government. This specifically refers to Thomas Harper (Kevin Costner) who watches from the wings as Jack recovers from the trauma and injuries of his accident. He has to learn to walk all over again and is only able to do this through the motivation of scoring a date with the attractive young medical student trying to complete her doctoral requirements in physical therapy. If you've seen any of the previous films or read any of Clancy's novels it is sure to be a treat to see the beginnings of this relationship between Jack and Cathy Muller (Keira Knightley). I have not read any of Clancy's work, but have seen all the previous films and while each of them follow a similar pattern this origin story (which Affleck's tried to be in many regards as well) of Ryan is does not seem to be based on any particular source novel of Clancy's which doesn't make much sense, but I digress. Instead once Ryan is ultimately settled in a desk job that is an excuse to delve into Wall Street accounts in order to do his actual work as a CIA analyst and a nice relationship with Cathy that only suffers from the fact they've yet to set a date for their wedding do things begin to get rolling. The set-up is all nicely done and gives us reason to like these people on screen while becoming invested in them which prepares us for the standard "destroying the world" plight that fuels the Russian enemy of Viktor Cherevin (Branagh with a thick accent). There is no need to get into the specifics, just know that Viktor has a plan to crash the U.S. economy and execute another terror attack and Jack Ryan is pretty much the guy to stop it. 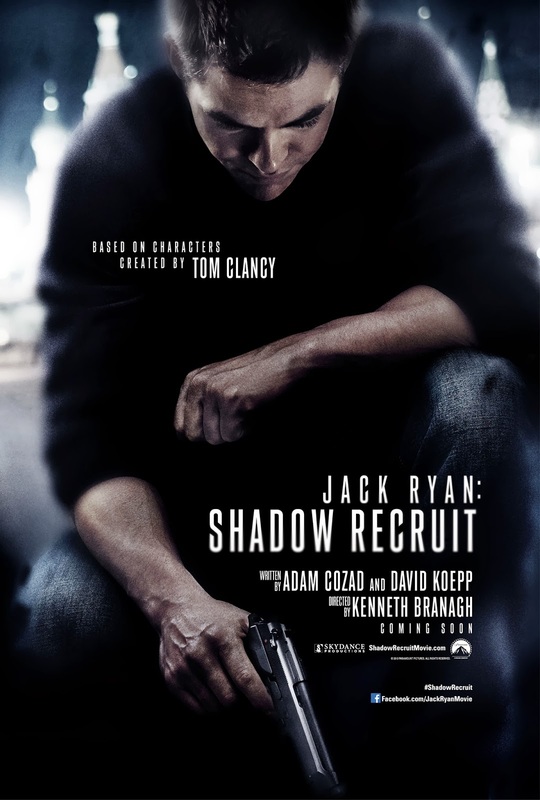 Jack Ryan: Shadow Recruit was originally scheduled to open on Christmas Day and lets all be glad it didn't because it would have no doubt tanked worse than the disappointing seventeen million debut it put up in the U.S. This leaves little room for hope of a continuation of this story unless it performs well overseas, but this is not a box office piece and the only reason I bring up the release date shift is because once it was moved off the Holiday calendar and into the dumping zone that January typically represents my expectations dropped quite a ways. Having now seen the film it seems clear it wasn't because Paramount didn't have faith in the picture, but simply because they didn't want it suffering the same fate as Grudge Match and 47 Ronin (two movies I didn't care enough to catch and would have easily chosen Ryan over). Shadow Recruit is an admirable piece of work that functions as a type of retro thriller that we don't often get enough of these days. Upon recently re-visiting the Ford entries in the Ryan canon it became clear why audiences felt so comfortable with this character and his place in the bigger world he somehow always managed to become entangled in. It was always a different approach to having Ryan land in the middle of conflict and it always showed that he was out of his element, that he had no desire to be a part of hand to hand combat or shoot outs, but simply do his duty, help his country as best he could with the skills he had to offer and go home to his wife at the end of the day. He is a boy scout, someone who cut and dry wants to do the right thing and has no intention of deviating from that path. These qualities still come through in Pine's take on the character and lucky for us create a protagonist we can really get behind. The reason I bring up the Casino Royale comparison is because it becomes evident once Ryan lands in Moscow and has to make his first kill that just so happens to take place in a bathroom flushed with white and is as brutal as anything else in the film where Branagh drew his inspiration. While this was a jolting re-introduction to Bond it is what happens after this event in Shadow Recruit that solidifies the real performance of Pine and the main difference between these two men who somehow wound up in the same type of action movies. Cathy Muller (Keira Knightley) does well to distract the evil Viktor Cherevin (Kenneth Branagh). While much is owed to the performances in this film it should not go without saying that the script from newcomer Adam Cozad and veteran David Koepp (Jurassic Park, Mission Impossible) does well to establish the world of the film and how each of the characters play into it as well as defining characteristics that influence certain outcomes of the story. As with the majority of films it was getting the ending right that tripped them up. The film is essentially three action set pieces placed near the beginning (though there is the nice prologue that shows the journey of Ryan from innocent bystander to integral agent), directly after one of the best scenes of the film that deals purely with sneaking into Cherevin's bank and getting the necessary files from his system to understand the scale over which he is operating and what it takes to pull that off and naturally the finale which is usually reserved for the biggest of them all. Up through the first hour of the film I was more than invested in the film, I cared about these people and the mission they undertook and how it was going to play out and how it would affect others both close and that of the innocent. I was genuinely engaged by the film and was taken aback by how much I was enjoying myself so much to the fact that I began to think of the film as something akin to Ghost Protocol in terms of pure action entertainment that yielded a brain, but then it decided to go and wrap itself up so quickly I hardly realized what was happening. After a well developed introduction and meaty middle section the final act of Shadow Recruit is nothing more than a slapdash effort that allows these intelligent characters to become superhuman and deduce conclusions so random it would seem impossible to figure out all that needed to be figured out in a single plane ride. It is unsatisfying and can't help but make me wonder what was left on the cutting room floor that would have made for a two and half hour endeavor worth sticking out. The performances not only from the charming Pine, but that of the stoic and reserved Costner and the sweet American-accented Knightley that brings a freshness to the picture with Branagh hamming it up only enough that we feel the depraved stench of his villain save this tragic misstep. It is a worthy cast who bring life to a tired genre and inject real-enthusiasm into the proceedings that make us sit up and pay attention, that is, until we see that no matter how hard it tries it has nowhere new to go and counts on the ticking clock and big kaboom to clench the conclusion.